Sophia Sandoval is a real-life superhero; only 3 years old but already a Wonder Woman. This little girl was diagnosed with medulloblastoma, a cancerous brain tumor, last year. She bravely fought back against the disease, going through surgery and rigorous rounds of chemotherapy to remove the tumor. 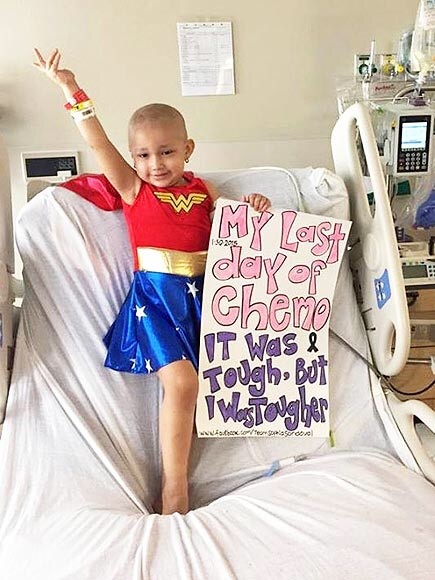 She recently completed her treatment by dressing up as her favorite superhero, Wonder Woman. On the final day of treatment, she held up a sign that read “My last day of chemo…It was tough, but I was tougher.” Sophia is an inspiration to all of us and we can learn so much from her strength and positive attitude. aww I am so glad she made it! REAL super hero right here! This entry was posted on April 13, 2015 by youcanmakemestronger in Story and tagged #medulloblastoma, #superhero, #wonderwoman.